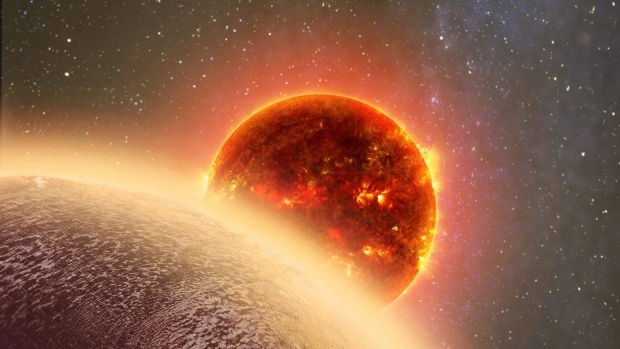 A new Venus-like planet has been recently discovered which is putting some “sizzle” into the search of exoplanets. Named GJ 1132b this newbie is sure to become a target for astronomers for years to come. And “whiffing” away they are with the help of the MEarth-South array, an observatory with eight identical robotically controlled telescopes located in Cerro Tololo, Chile. Thanks to MEarth-South, astronomers have discovered a whole lot about this Venus-like twin. They know it orbits a red dwarf star which is only one-fifth the size of our Sun. GJ 1132b is cooler and much less luminous than the Sun with only 1/200th its light. In addition, it orbits its star every 1.6 days at a distance of 1.4 million miles (2.3 million kilometers). Put this all together and you have a planet that is scorching with temperatures around 450 degrees Fahrenheit (230 degrees Celsius) so any hopes of any water on this planet is slim as it would most likely all boil off; however, the good news is water may still be present in the atmosphere. Other facts researchers were able to obtain is GJ 1132b is much cooler than other exoplanets which are confirmed to be rocky. It is 16 percent larger than Earth, measuring in at 9,200 miles (14,800 kilometers) and has 60 percent greater mass than our planet — this means its rocky composition is similar to Earth’s. In addition, GJ 1132b has gravity like ours. Researchers have also uncovered the facts that since the red dwarf is so small, the size of the planet (to the star) must be larger than it would be for a Sun-like star. This is exciting for astronomers as it’s close distance makes it easier to find out is an atmosphere does indeed exist on GJ 1132b. To further the studies the researchers are looking for help from the Hubble and Spitzer Space Telescopes…could this Venus-like planet have siblings? Time will only tell. Until then let’s take a look at the MEarth-South array. here are two observatories located at opposite ends of the Earth. The MEarth-South which we briefly touched on and the MEarth-North array which searches the skies from the Fred Lawrence Whipple Observatory (FLWO) on Mount Hopkins, just south of Tucson, Arizona. This dynamic-duo of telescope locations can cover both the Northern and Southern hemispheres in search of exoplanets transmitting the closest M dwarfs. And the neat thing is both these arrays are controlled remotely from the offices located in Cambridge, MA. The MEarth-South responsible for finding GJ 1132b has also picked up and continues to monitor thousands of red dwarfs all located within 100 light-years from us. This is done by simply looking for planets that cross in front of their host stars. When they do this they dim which tells researchers the approximate physical size of the exoplanet. After this occurs, other telescopes are brought online to help gather more information like the planet’s mass. What wonders we can now behold thanks to modern technology. With telescopes constantly scanning deep into the galaxy we are sure to find objects that will amaze and astound our minds. Hubble Breaks Distance Record and Spots New Galaxy!